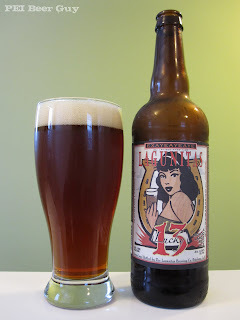 This long-named Lagunitas Lucky 13 Mondo Large Red Ale pours a mostly clear, medium amber that has some red/rose tint to it. A hard pour gives a modest finger or so of head. It doesn't stay around for long, but what remains is surprisingly sticky / creamy. Lots of it sticks on the way down. The smell is pretty fantastic. At first it comes off as almost only the Amarillo hops. It's got a great IPA-like sweetness that brings to mind pineapple & plum (more like plum sauce, really), and a bit of the "standard" grapefruit or even lemon. There is definitely a malt sweetness in there, too, but the way the malt blends with the hops brings an overall smell of something like a red candy apple. It's that sweet. The taste is a neat combination of styles, really. It doesn't have any "staleness" that I have found some of my recent reds had. This is very fresh and bright. It's got a smooth, malty backbone, slightly hidden under the brighter, fruitier hops and bitterness. As it warms up, the malt and bitterness strengthens. Lagunitas' site says it's "smoky", but I don't really pick that out. It's got an abv of 8.3 %, but you'd never guess it. It's "sneaky strong". The carbonation might be a little on the sharp side, but I like my bitter, hop-heavy beers like that, so I won't fault it too much. The body / mouthfeel is medium or perhaps a bit better, with a sticky finish - it coats fairly well. The bitterness, although rated at about 77 IBU's, doesn't come off as very in-your-face, especially at first. It's balanced well. Overall? Pretty much loved it.